Philip Hammond clearly thought twice before jumping into a driverless car on the day before his Budget. The headlines about a driverless government would have been all too obvious, but he should think more, too, about the very concept and whether it is either feasible or desirable. There is a tendency for the latest technology to be touted as the way of saving the country from disaster and being the key to the next economic revolution. The introduction of driverless cars has been presented by politicians, including many on the Labour benches, as being inevitable but even a cursory examination of the state of the technology and the difficulties in its widespread adoption should make them hesitate before making unthinking predictions. It was noticeable that the Chancellor hardly mentioned driverless cars in his speech, having stated to the Andrew Marr programme on Sunday that legislation would be brought forward to enable driverless cars to be on our streets by 2021. You read it here first but they won’t be. I have just written a short book about driverless cars (Driverless cars: On a road to nowhere to be published in February) and from my research it is clear that that the hype over these cars is completely divorced from reality. The Chancellor once famously asked me why sparsely-filled trains could not be required to give cars priority at level crossings, of which there are several in his constituency, rather than the other way round, which suggest he might lack a little savoir-faire when it comes to transport matters. Charlie Henderson of PA Consulting quickly debunked Hammond’s statement, saying ‘the reality is that AVs [autonomous vehicles] are not going to be a common sight on the roads any time soon. Our latest research has found that AVs could be ten years away or more. However, perhaps between Sunday and Wednesday Hammond indulged in a bit of research into driverless cars and spoke to people like PA Consulting. Not only is it technically very difficult to develop these cars, but it is also clear that there is great consumer resistance to them. He might have realised this and thought better about making a huge song and dance about them. The idea of ‘driverless’, which is better defined as ‘autonomous’, is being pushed by a combination of auto manufacturers desperate not to be left behind in the race for the latest development and technology companies with hordes of monopoly profits they don’t quite know what to do with. Yet, even with the billions spent so far, and years of hyped announcements in the media, their vision of a world of fully autonomous cars whizzing around our motorways and city streets is as Henderson puts it, decades away. The optimism in Silicon Valley during the early years of development when the concept of full autonomy seemed just a few years away has turned into the realisation that replacing human drivers with a combination of computers, sensors, lasers and cameras is far more difficult than first envisaged. Humans may, indeed, cause many accidents but mostly we are actually quite good at avoiding them. And machines are pretty dumb. Take the very minor mishap in Las Vegas last week when a driverless bus was hit by a reversing truck. The bus sensed the danger from the truck and stopped. However, the truck driver did not notice the bus and hit it, causing minor damage. The bus’s developers immediately blamed the driver, saying the incident would not have happened if the truck had been driverless. However, if there had been a human driver in the bus, they would have sounded a horn or reversed out of the way. But the bus simply sat there, allowing the truck to hit it. ‘Well, it could have been fitted with a device that made it sound a horn when another vehicle was approaching’, said one of my Twitter followers. That may be possible but there would be so many false alarms that it would make Kolkota’s streets seem like a library. The most intractable problem for this technology is a very simple one. Autonomous cars will have to stop if a person stands in front of them. They cannot be programmed to maim or kill. Therefore, on streets crowded with people, they will be unable to advance. Moreover, in remote areas they could easily be stopped and hijacked. On the BBC World Service, recently, my point was put to Professor Paul Newman, the head of Oxford Mobile Robotics Group and his rather feeble response was that this was a ‘ludicrous’ idea as the cars would be fitted with all kinds of monitoring devices. Tell that to Johannesburg carjackers. The tech and auto companies are portraying the future as one of shared use autonomous pods, basically driverless Ubers. This may seem attractive to urban-dwelling Millenials but hardly likely to suit the needs of the golf-playing suburbanite with his clubs and his kids’ baby seats permanently in the car. To achieve their goal numerous restrictions will need to be imposed, such as banning driven cars from the roads and preventing ‘jaywalking’. Yet, if we really want to reduce road deaths, cut pollution and free up our city centres, there are all kinds of conventional transport policies which could be implemented now, such as congestion charging, improving public transport and reducing car parking spaces. 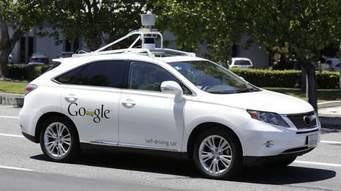 Autonomous cars are being touted as a technological solution to what are political and social problems and politicians should not be taken in.